Dive to the depths of the sea to solve the mystery of the SS Victory � a ship that sunk over 100 years ago. Click here to play! It's rumored that ship's hull was filled with royal treasure. 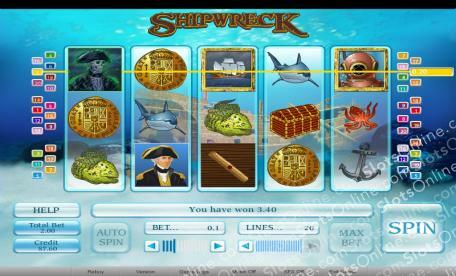 Find the ship's wooden skeleton on the seafloor and uncover your share in the sunken treasure! The SS Victory was a fine ship in her day and there is a symbol to remind you of her glory. Keep a close watch on this symbol as it acts as a substitute. It only appears on selected reels but will replace most other symbols to create more winning combinations. It will also double prizes when it appears in a winning line. You'll also want to see if you can find the ghostly captain of the Victory. Spin one to five of his symbol and you could get up to 2500 times your line bet. Other treasures to watch out for while searching the depths of the oceans include scrolls, treasure chests, helms, golden coins and anchors. You'll also want to keep an eye out for sea creatures such as sharks, octopi, jelly fish and eels as all of these will help you bring in your treasure. The diving helmet is a crucial piece of equipment in this quest. This symbol acts as a scatter. Spin two to five of them anywhere on the board and you will multiply your total bet. If you spin three or more on selected reels you will trigger a bonus feature that will allow you to gather even more treasure. Dive through the watery depths to find the ruins of the SS Victory and collect your sunken treasure! The dive helmet acts as a scatter symbol. If you spin two to five to multiply your total bet by 1, 3, 10, 100 times respectively. Ifyou spin three or more you will trigger a bonus feature. The SS Victory ship symbol acts as a substitute. It only appears on reels 2,3 and 4 but will replace all other symbols (excluding scatters) to create more winning combinations. It will also double the prize if it appears on a winning line. The dive helmet will trigger a bonus feature if you spin three or more from left to right (including reel 1) or right to left (including reel 5). In this game you will have to help the diver get to the bottom of the ocean by selecting how much air it will take. The deeper the diver gets, the bigger your prize!